Tennessee wrap-up: Vols fought hard, but resistance is futile | TideFans.com | By the Fans, For the Fans. One of the most illogical developments in the Southeastern Conference in recent years has been the ascension of Phil Fulmer to Tennessee athletic director, roughly a decade after he was forced to vacate the position of Tennessee head coach. We’re going to assume Fulmer had a front row seat, then, for Saturday’s 58-21 beatdown. 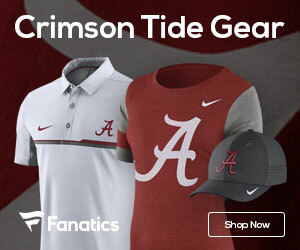 Alabama set a record for points scored in this venerable series, and for awhile, it looked like the Crimson Tide would set the new record far out of anyone’s reach. As has been customary in 2018, though, Nick Saban had mercy on the opponent as the game clock ticked away, and Alabama’s offense played a scoreless fourth quarter. Alabama even had to sub out Jalen Hurts at quarterback mid-series to ensure it stayed that way. Tennessee fans who grew up watching Peyton Manning drop bombs on opponents, seemingly without resistance, ought to have a keen appreciation for what Tua Tagovailoa did Saturday. Tagovailoa has now thrown 25 touchdown passes and no interceptions. If fans are successful in bringing back EA Sports’ beloved NCAA Football video game series, the developers will have to create a new rating in the game specifically for Tagovailoa. That’s because as good as Manning was, we’ve never seen anything quite like this before. As it now stands, with college football in its post-modern era, the era of scholarship limitations, endless television contracts ensuring even the lowliest of programs can sell face time to recruits, rules heavily favoring offense in the name of safety, and unprecedented access to scouting information – no team should be able to basically name its score. Well, as the viral Bama ad campaign is wont to say … Alabama does. There’s little doubt LSU is going to give Alabama a different kind of test in two weeks. Whether a different kind of test means a stiffer test is yet to be seen. So far, Alabama has been so much better than its eight opponents to date that fans consider it a letdown if the third-team quarterback doesn’t make an appearance. In Tennessee, Alabama found an opponent that has been decimated, as a program, since Fulmer’s ouster. The Vol offensive line was poor at picking up blitz tells, and even worse at keeping its composure. There were no playmakers at tight end, no go-to running back that could churn up an opponent’s front seven. Neither Jarrett Guarantano nor Keller Chryst looked more than serviceable as a quarterback. 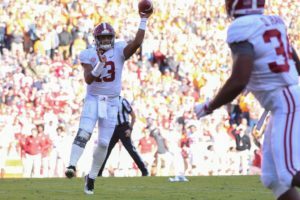 The defensive line was outgunned, the secondary pushed around, the linebackers ultimately unable to affect Bama’s running game. This isn’t to say Tennessee didn’t try. Jeremy Pruitt may or may not become a top-tier SEC coach one day, but the one thing that can already be said of him is that his players are responding to his demands to show effort. Whether they can harness their energy and get rid of the over-aggressiveness that shone through on several occasions Saturday is a different question. UT essentially had one playmaker – WR Jauan Jennings – a handful of solid guys who would look fantastic if they had more supporting pieces around them, and borderline SEC talent everywhere else. It must chew at Fulmer’s guts to know that everything he worked to build 20 years ago has mostly faded away. And it is especially bitter to realize the team that showed just how far the Volunteer program has fallen is the team Fulmer once thought was going out of business. 1. Offensive line dictated the pace and Deonte Brown was a big part of that. After weeks of talking about it – weeks meaning there was talk of it back in fall camp – Alabama replaced Lester Cotton at guard with Deonte Brown. It’s difficult and often lamentable when an experienced senior must be replaced, but Alabama has gotten inconsistent guard play from both Cotton and Alex Leatherwood all year. In this game, Leatherwood played arguably his best game of the year, and Brown ‘s performance in place of Cotton was brick-solid. Tennessee’s defensive line is far from the most talented Alabama will face, but Kyle Phillips is a quality defensive end and aside from the batted-ball interception that literally fell in his lap, Jonah Williams and Brown stoned him. Shy Tuttle and Alexis Johnson were rendered non-factors. Two middle linebackers, Quart’e Sapp and Daniel Bituli, tied for the game lead in tackles with 8 – Sapp played the first half, Bituli the second – yet they combined for only 0.5 tackles for loss. The translation there is that Alabama’s offensive line was getting past the first level frequently. This is going to be a key going forward, as all three of Alabama’s remaining conference opponents have first-grade defensive lines. 2. RB rotation catered to what Bama does best, and gave Jacobs a chance to shine. Damien Harris’ non-start was attributed to some kind of internal punishment, but his loss was Josh Jacobs’ gain and Bama might end up being the better for it. Jacobs fits a spread offense better than Harris, as it gives his versatility a chance to be front and center. Jacobs led Bama in rushing but more telling was how he picked his way through holes and found creases in the UT front. Harris will probably be back in his old spot next week against LSU, but this position is probably now under competition. Najee Harris continues to turn heads as Bama’s late power option, to the extent that he just might get some opportunities earlier in games. Again, it’s somewhat hard to tell what Alabama can take forward out of this game, so mediocre were the Volunteers, but our take on Jacobs was that he’s a weapon in the shadows waiting to be unleashed. 3. Inside LBs played one of their best games, especially against the run. Dylan Moses had several key run fits and filled the holes he needed to fill. With Tennessee staying in power sets for much of the day, Bama was able to practice its base alignments, or at the very least, no more than a nickel look on most downs. That’s a crucial development given what’s coming the next two games, as LSU’s power sets and Mississippi State’s QB run game will put pressure on the inside backers to step up. Mack Wilson had another solid game, and Christian Miller and Anfernee Jennings both did good work from the outside. As solid as Miller and Jennings were, though, let’s give special kudos to the guys in the middle for taking out Tennessee’s between-the-tackles running game. 4. DBs held their own again with Diggs out. Jared Mayden didn’t play as much as in previous weeks due to alignment, but when he did play he made some plays and most importantly, started to look more comfortable. The loss of Trevon Diggs hasn’t been felt at corner so much as the cascade effect of his absence has reshuffled the secondary and put the inexperienced Mayden on the field as Bama’s dime back. Shyheim Carter is focusing solely on Star safety now, and he’s probably been helped by that development. Saivion Smith’s performance at cornerback has been solid, while Patrick Surtain II is as close to a shutdown corner as one can be as a true freshman. Aside from Jauan Jennings’ day, Alabama mostly held Tennessee’s wideouts in check; WRs not named Jennings combined for 3 catches. LSU has big receivers like Dee Anderson and Stephen Sullivan, but no one with Jennings’ level of proven production. Knowing that the Crimson Tide can match up with bigger receivers gives Bama one less thing to worry about. 5. Mike Bernier’s debut gives Bama hope for better special teams play. We’ve been calling for it for several weeks and Saban finally pulled the trigger on a change at punter. Mike Bernier hit a pair of 41-yard punts to prove he’s more than just a human interest story (regarding the loss of his mother to breast cancer). Before fans are ready to anoint him the second coming of J.K. Scott, it needs to be said that both Bernier’s punts had strong tailwinds behind them, but that doesn’t change the fact he hit both squarely and without problems with his delivery. Alabama doesn’t need the next Scott; Alabama needs the next Jeremy Schatz, and that’s probably what Bernier is. But if he can just average 35-40 yards per punt on the way in and keep opposing punt returners calling fair catches, that will be more than good enough for this team. Congratulations, Mike Bernier, for sticking with it and being rewarded in your senior year.